Through the implementation of a Junior League created and branded curriculum, JLOC volunteers educate members at the Boys & Girls Clubs of Oklahoma County on a variety of interactive healthy eating topics. Kids in the Kitchen and Top Chef caters to two different population demographics at the Club based on age. Kids in the Kitchen teaches children, ages 6-9 years, fun ways to learn about healthy eating by utilizing recipes with ingredients they might have at home. The program teaches participants ways to make healthy choices at school, and ways to prepare simple, healthy snacks at home. Recognizing many children this age are not responsible for purchasing the food options found in their home, the curriculum focuses on empowering children to better understand options in the grocery or convenience store, and how similar price-point items can be substituted for common unhealthy snacks. Top Chef, an extension of Kids in the Kitchen, teaches children/teens, ages 10-14 years, healthy eating principles in a hands-on environment over the course of a five or six- week session (depending on the OKC school year calendar). JLOC volunteers work with a group of Club members weekly, teaching them about healthy foods and the preparation of healthy snacks. This project also promotes and encourages participation in a physical activity. 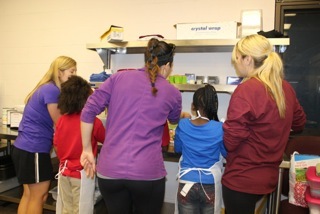 All planning for the weekly menu and the physical activity is planned by JLOC Volunteers. Club members in the Top Chef program learn their way around the kitchen, how to prepare a written recipe, how to create a snack or meal with no recipe, how to plan a meal and write a grocery list, and how to prepare a dish they create on their own — all with the help of the JLOC volunteers. The program also includes weekly mini-competitions, akin to the popular television show.